The symptoms of hypothyroidism can consist of muscle stiffness and pain, extreme fatigue, unable to withstand the cold, a hoarse voice, weight gain and constipation. It can make your skin dry and create hair loss. It can also cause depression. Although this is a pretty big collection of symptoms, it is not all inclusive. In the majority of cases hypothyroidism is an autoimmune disease, and in its short form it is called AITD (autoimmune thyroid disease). Studies are showing that there is a connection between AITD and gluten intolerance. This is a condition that contributes to hypothyroidism. What happens here is your immune system attacks your thyroid, which then creates an inflammation which in turn causes the hypothyroidism. It impairs the glands ability to make thyroid hormones T4 and T3. The attack is the cause of the Thyroid problem. Hashimoto is the most common cause of hypothyroidism in the United States. Graves’ disease has the opposite effect on the thyroid where it causes it to become over-active. This is called hyperthyroidism. However, it is not as common as Hashimoto’s. Both Hashimoto’s disease and Grave’s disease are classed as autoimmune thyroid disease (AITD). It is a common word that most of us have heard. It is normal now to walk through the grocery store and see many foods labeled “gluten free”. The name gluten applies to the proteins that are found in many of our foods like wheat, rye and barley, for example. As the name suggests it is somewhat like a glue that helps various foods keep their shape and stick together. It isn’t a food allergy. Undigested gluten proteins (prevalent in wheat and other grains) hang out in your intestines and are treated by your body like a foreign invader, the immune system begins to attack the protein portion gliadin, irritating your gut and flattening the microvilli along the small intestine wall. 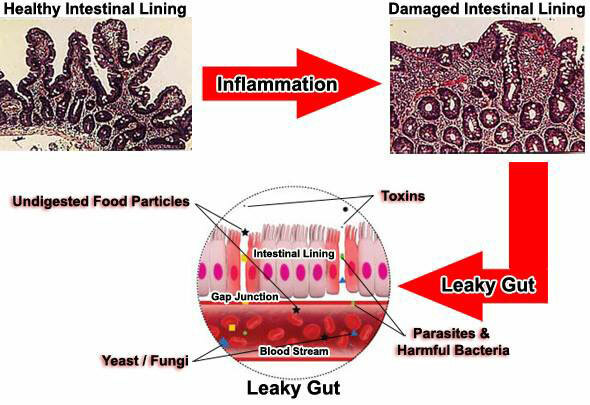 This can cause a condition called leaky gut. You have considerably less surface area with which to absorb the nutrients from your food and the barrier between the gut and bloodstream becomes breached. This breakdown allows entry of other undigested foods, chemicals, bacteria and toxins to enter the bloodstream. This leads sufferers to experience symptoms of malabsorption, including chronic fatigue, neurological disorders, nutrient deficiencies, anemia, nausea, skin rashes, depression, and more. You can test negative for Celiac disease and still have Gluten Intolerance. How common is the connection between AITD and Gluten Intolerance? There have been so many studies conducted that have concluded there is a link between AITD and Gluten intolerance. It has been strongly suggested that when an individual is being tested for one condition, they should also be tested for the other. How does the connection occur? The protein portion of gluten has a molecular structure that is very similar to the thyroid gland. So the immune system of the body makes a mistake when identifying what the gluten is. When it goes to attack it, it can also attack the thyroid tissue because the two are so similar in structure. The immune system goes into the attack mode when the gliadin which is the protein contained in the gluten gets past the gut’s protective barrier (Leaky Gut). This protein then gets into the blood stream where it becomes detected by the immune system. Based on this, it presents a very strong case for eliminating gluten from your diet if you have been diagnosed with AITD. Gluten is considered an antigen. Antigen: A substance that the immune system perceives as being foreign or dangerous. The body combats an antigen with the production of an antibody. Getting tested for gluten intolerance? Once you have been diagnosed with AITD your health care provider will use some form of treatment to keep this thyroid disease under control. Most commonly Thyroid hormone replacement. Is this really fixing the cause? I’m not suggesting that Thyroid hormone replacement is not necessary as the thyroid no doubt is unable to produce adequate amounts of Hormone. But why is it not able to do this? Hashimoto’s AITD is the cause. 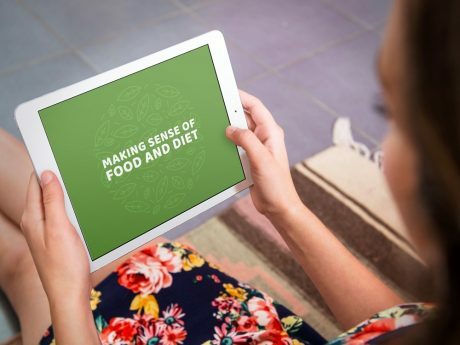 The effects of gluten has to be strongly considered, especially when there is such strong supporting evidence of the connection between AITD and gluten. First you need to become educated as to what foods contain gluten. Unfortunately, grains , breads and pasta are a big part of most diets. . It isn’t good enough to just reduce your gluten consumption, it is important to totally eliminate it. This can be a drastic change in lifestyle. It is also important to become aware of cross reactivity. Gluten Free foods are not always safe. Rice, dairy, potato, corn, egg, tapioca can also cause the same problems as gluten. Fortunately, Cyrex labs has testing for cross reactive foods. Without testing you should really stay away from all grains and gluten free foods. Action steps, get tested for Hashimoto’s. You may have a food sensitivity that is driving the AITD. 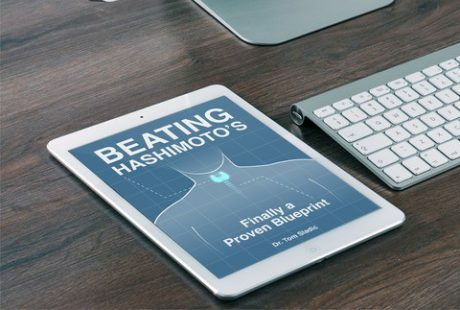 If you need help getting tested or you need a plan to help beat Hashimoto’s schedule a case review.